For bookings, advice and more details about our treatments and services. We are directly opposite the Bvlgari Hotel. The nearest underground station is Knightsbridge, on the Piccadilly line. Follow Exit 1 (North) Knightsbridge and Hyde Park. 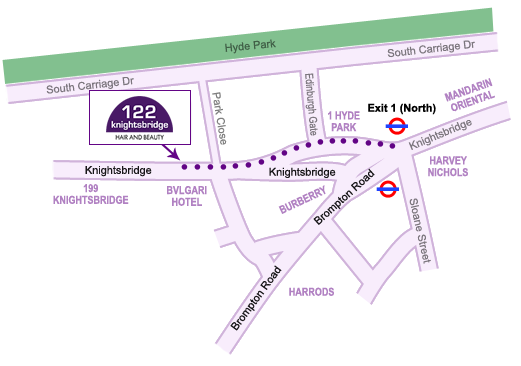 At street level, turn right and after a minutes walk you will find 122 Knightsbridge on your right. Please note: Our postcode is not suitable for use with Sat-Nav GPS devices.